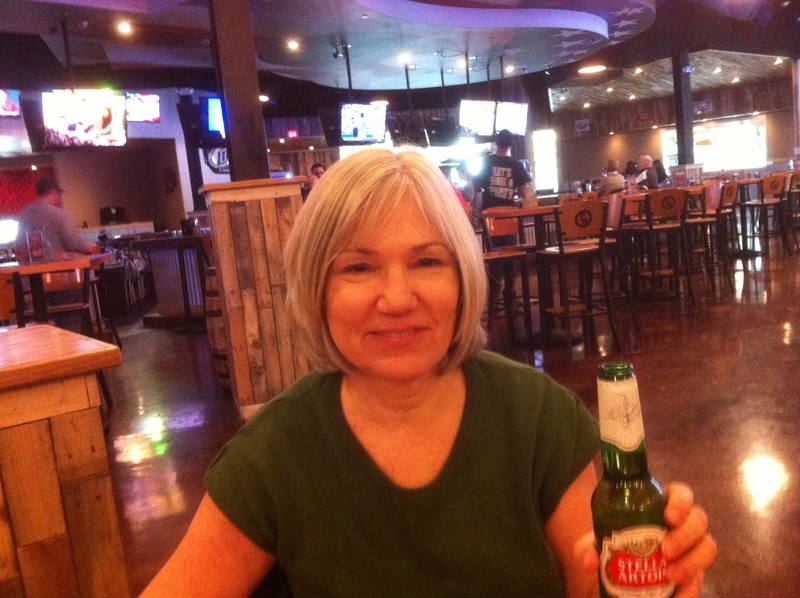 Toby Keith’s place passes the first test with Karen Bialczak. The waitress was well-versed on the beer side of the menu at Toby Keith’s I Love This Bar and Grill. Stella Artois, my dear wife’s order, was available in bottle. Fine for Karen, who prefers that vessel of beer delivery. For me, though, there was one and only one way that I was going to drink my first beer ever at this new joint in Destiny USA. Yes, there are signs of the namesake’s popular country songs everywhere in this expansive room. And I mean this literally. Wall hangings throw favorite lyrics right at you. Really, though, on this late Thursday afternoon as we took advantage of the tail end of Karen’s day off, what we were most looking for was good food. As a restaurant, Toby Keith’s new place rocked in a country flavor. The soundtrack was all country, various artists, with enough TK songs on the playlist. It was loud enough to hear the lyrics but did not make us shout to converse. The menu offers gimmicky southern fare like fried bologna sandwiches and fried mac and cheese. But I went straight for the bacon and cheddar burger. Side? Cole slaw. I must compare and contrast that cabbage delight at any new place I can find it. Karen went for the steak sandwich with fries. We both started hungry, ate happily, and ended full. The burger was big, moist, cooked medium as ordered, and delicious. The slaw was light, crisp and carried a hint of apple. Or maybe it was cranberry. Definitely something fruity, although I couldn’t find a visible sign of any fruit. Toby Keith’s slaw has its own taste and texture. Nice. Karen gave thumbs-up to the steak sandwich and let me snag one of the Freedom Fries. Well-seasoned. Dark, golden. Tasty. The waitress was friendly and knowledgeable. She presented well, too. All the wait staff was dressed to impress in a country style. The shorts and tight shirts on the women were more subtle than, say, the Hooter’s uniform, we decided. After the food and beer — the Mason Jar holds 32 ounces, and one (at the cost of eight bucks, FYI), was plenty — we strolled around the perimeter of the huge room. Restaurant tables circle the big bar in the middle. There are 40 or so big and beautiful flat screens to feed the inner sports fan. I was surprised that there wasn’t a pool table in the place. A concession stand near the entrance sold a pretty good variety of Toby T’s, and at prices lower than you’d find at a concert. The “Should’ve Been a Cowboy” dark gray model for 20 bucks caught my eye. Other shoppers were admiring the cowboy hats, for $30. The stage end of the room looked inviting. The raised performance spot was big enough to fit a half-dozen but not too grand to dwarf a duo. The April band calendar lists the most popular Central New York county music acts playing four nights a week, Wednesdays through Saturdays. Music starts at 9 on Wednesdays and 9:30 other nights. Last night, they decided not to book music against Syracuse vs. Indiana in the NCAA Tournament. Grit N Grace plays its modern country tonight, and the Fulton Chain Gang performs Saturday night. Every now and again, a national band is scheduled. Keith’s franchise is a dozen and growing. He’s been known to drop in, to play and socialize. One would think those visits would coincide with big tour dates. The closest to Syracuse listed now on Keith’s site is July 21, at Darien Lake. He has in the past, though, performed at the New York State Fair Grandstand in Syracuse and the Event Center at Turning Stone Resort and Casino in Verona. Keep your eyes open. Keith at his own bar surely would be a spectacle to remember.